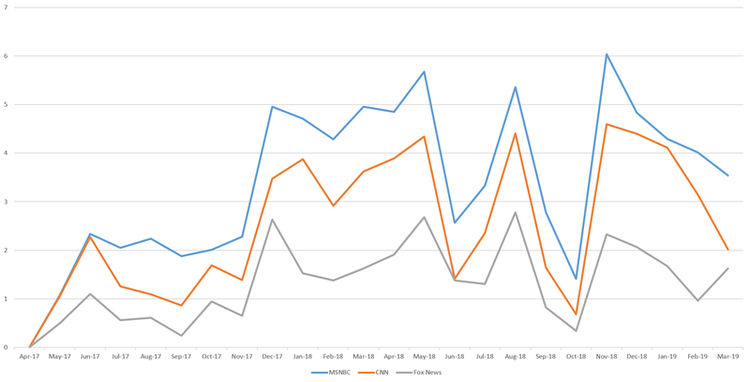 The timeline below shows the percentage of monthly airtime on the three channels that mentioned Mueller from April 2017 (just prior to his appointment) through March 17, 2019, using data from the Internet Archive’s Television News Archive. Overall they have largely moved in sync, but MSNBC spent 3.38 percent of its airtime mentioning Mueller, compared with 2.47 percent of CNN’s and just 1.31 percent of Fox News’ airtime. The timeline below shows the total percentage of monthly airtime each station devoted to mentioning Trump over the same period. While the ebbs and flows of attention are slightly different, MSNBC is once again the clear leader in total airtime devoted to the president, followed again by CNN and Fox. Overall, MSNBC spent nearly two-thirds as much airtime as the other two combined in reporting on the president. Comparing its coverage of Mueller and Trump, MSNBC spent 4.4 times as much airtime mentioning Trump as it did Mueller, compared with five times as much for CNN and eight times as much for Fox News. Clearly, Fox is far more interested in the president than in the investigation of him. How did all of this news coverage compare with online search interest? The timeline below shows the combined airtime of the three stations mentioning Mueller compared against U.S. web searches for the special counsel from Google Trends. Since the two use different scales, the graph below reports them both as standard deviations from the mean (Z-score). Immediately clear is that television news coverage and web searches have increased and decreased in lockstep. 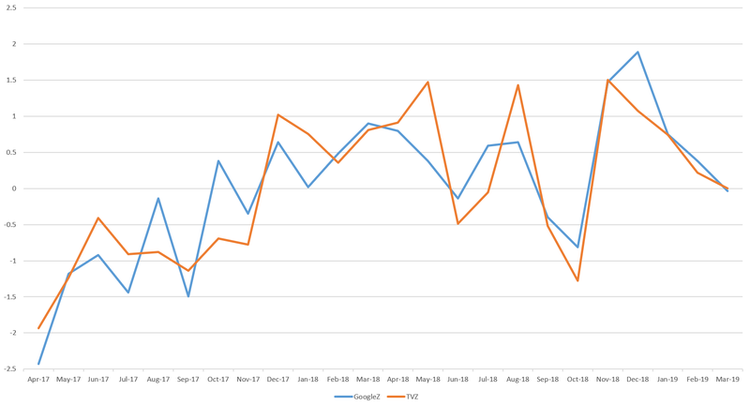 From the announcement of the Mueller investigation, both coverage and searches increased steadily through spring 2018, then leveled off until both reached a low point in October 2018, before peaking in November/December 2018 and declining since. Putting this all together, MSNBC has clearly been fixated on the Mueller probe, but also has heavily emphasized Trump as a whole, with CNN a close second and Fox News paying far less attention to either. While Fox News may be the president’s station of choice, it actually spends far less time mentioning him than its competitors.